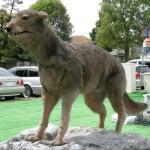 It lived on the Japanese islands of Honshu, Shikoku, and Kyushu primarily in remote mountain areas. The Honshu wolf was identified in 1839 as the gray wolf subspecies Canis lupus hodophilax by Dutch zoologist Coenraad Temminck. 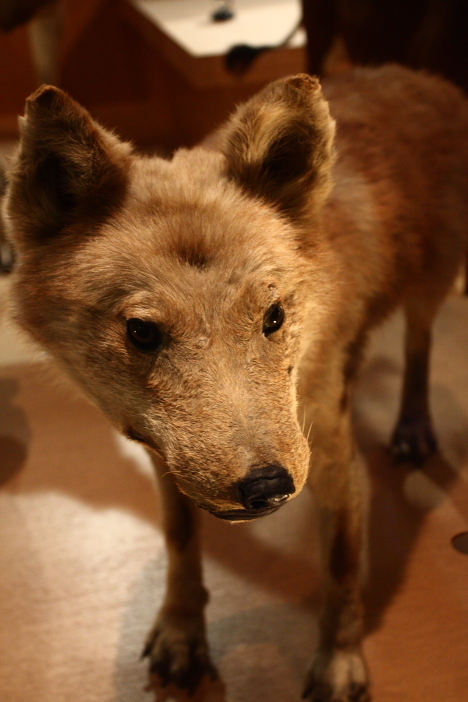 It was also known as the Hondo wolf, the yamainu, and the mountain dog. The Honshu wolf was the world's smallest wolf, standing just over a foot at the shoulder and measuring 35 inches from nose to end of the tail. They had short wiry hair and a thin dog-like tail that was rounded at the end. Their legs were shorter in relation to their body length. In many ways, it resembled dogs, coyotes and jackals much more so than its Siberian wolf ancestors. 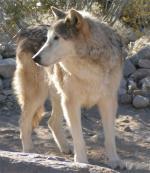 Although it is presently classified as a gray wolf subspecies, many argue that its physical differences are enough to consider the Honshu wolf to be its own species. Some believe it may not have even been a true wolf. The Honshu wolf was known to have preyed on deer, wild boar, and smaller pests. Farmers praised the wolf for keeping down the number of animals that might otherwise damage their crops. Honshu wolves were abundant in Japan until 1732 when rabies was introduced to the island. It was rabies, deforestation of the wolf's habitat, and and conflict with humans that led to their extinction. The last specimen was officially killed in 1905 in Nara Prefecture on Honshu Island, Japan. Although there have been many sightings claimed since then, none of them have been verified. There are five mounted specimens known of today; three in Japan, one in the Netherlands, and the last officially killed specimen in a British Museum.